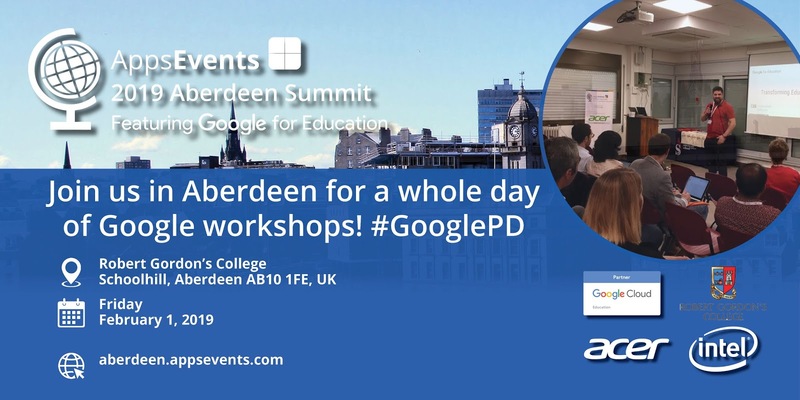 Aberdeen, UK -- An educational summit featuring Google for Education will be hosted for educators in Aberdeen area schools on 1st February 2019 with a series of workshops throughout the day led by highly acclaimed Google Certified Trainers and Educators. The goal is to help administrators, educators, specialists and assistants/paraprofessionals learn how to use the tools for productivity and/or in innovative ways to engage learners to be successful in achieving competency in all areas of the curriculum. Everyone is invited to attend and registration can be found at the event website https://aberdeen.appsevents.com/. EARLY BIRD registration pricing available until end of November 2018. As an official Specialized Google Cloud PD Partner, AppsEvents Summits and Bootcamps featuring Google for Education provide high quality professional development for educators and professionals worldwide. You'll leave with skills and ideas that can be implemented immediately in the office and classroom.